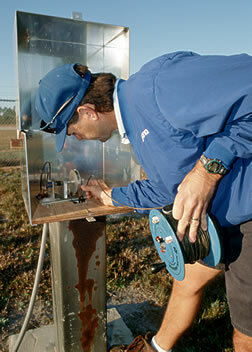 Scientists regularly monitor groundwater levels at wells throughout the state. The Hydrologic Analysis Team (HAT) applies the most appropriate science to the modeling and data analysis to support decision making for the Central Florida Water Initiative (CFWI) and to ensure work completed is technically defensible, understood by the initiative participants and collaboratively developed. The East-Central Florida Transient (ECFT) Groundwater Model is a computer model of the hydrologic system in central Florida that was developed by scientists at the U. S. Geological Survey (USGS) and modified by the HAT. This model was used to evaluate the effects from changes in groundwater withdrawals and other components of the water cycle on water levels in lakes, rivers, springs, and wetlands in support of the 2015 CFWI Regional Water Supply Plan (RWSP). In preparation for the 2020 update of the RWSP, the HAT is expanding the model to provide a single groundwater model that encompasses the entire CFWI area. The expanded model (referred to as the ECFTX model) will extend from the Gulf of Mexico on the west to the Atlantic Ocean on the east and from southern Marion County in the north to the Highlands/Glades county line in the south. The model will simulate three-dimensional groundwater flow in the surficial aquifer, intermediate aquifer/confining unit, Upper and Lower Floridan aquifers, and associated middle confining units. Completion of the model is scheduled for December 31, 2017. Statistical analysis and other data analysis techniques will be used to further investigate and quantify the factors affecting water levels in lakes, rivers, springs, and wetlands. Relationships that are developed will be used to corroborate results of the ECFTX groundwater model and quantify effects of withdrawals on lakes, rivers, springs, and wetlands. As part of developing the ECFTX model, the districts have contracted with three expert modelers to conduct independent scientific peer review as the model is being developed. This will enable the HAT to incorporate significant comments before the model is completed and thereby provide the best possible modeling tool. The review will consist of four major tasks: 1) Introduction and Background, 2) Conceptual model and calibration plan, 3) Interim model calibration results, and 4) Final model documentation. The review is scheduled to begin August 25, 2016 and is anticipated to be completed by September 1, 2017. Meetings conducted by the peer review panel will occur as teleconferences with links to a web- based utility for the purpose of sharing presentation material. Additionally, two face-to-face meetings will be held at a location in the Orlando area. The face-to-face meetings will also be available via a teleconference and web-based utility. Information on the date and time of each meeting, as well as the information needed to attend and access these meetings, will be provided on the “Meetings” tab on the CFWI home page. If you wish to make a comment you must first register. Click on “Register” in the upper right and follow instructions from there.